Matthew C. Workman is an attorney with civil litigation law firm Keis George LLP. For the past nine years, Matt has represented insurance companies and self-insured corporations in the State of Ohio within the practice of insurance subrogation. 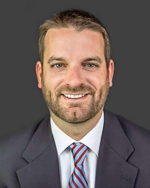 A civil litigation attorney whose primary practice areas include subrogation and insurance defense, Matt also has extensive experience defending clients in legal malpractice suits, meticulously uncovering negligent circumstances leading to the clients’ preceding harm. Matt is currently a member of the National Association of Subrogation Professionals, the Ohio Bar Association, and the Delaware County Bar Association. A proud National Order of the Coif alumni, Matt enjoys golfing, spending time with loved ones, and refining creative litigation methods to ensure a swift and diligent recovery.